News this weekend was dominated by the shooting at Sandy Hook elementary in Newtown, Connecticut. When atrocities like this occur thoughts inevitably turn to previous similar happenings. In just the past 6 months there have been other mass shootings in the U.S., notably at the Wisconsin Sikh temple and the Aurora, Colorado movie theater. I imagine comparisons will be made with the Nickel Mines Amish school shooting of 2006, given the elementary school setting. The Newtown children were all aged 6 or 7, first-graders (along with 6 adults killed). The youngest Nickel Mines victim was age 6, on up to 13. It’s difficult to contemplate such evils but even more so given the ages involved. Just wondering if and how the Amish might respond to the tragedy in at the Connecticut school shooting. I’m sure similar to the Nickel Mines shooting, they would be forgiving of the killer, but I’m wondering if a busload of Amish would travel to visit the families to encourage and counsel them? Or would this be seen as being too much “in the world” since the Amish as a group were not involved? There is some precedent for Amish attention to similar tragedies. 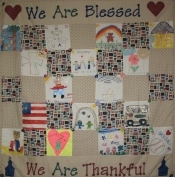 A group of Nickel Mines Amish delivered the comfort quilt (originally created by Ohio schoolchildren following 9/11) to victims’ families after the Virginia Tech shooting in 2007. Sadly, the comfort quilt never stays in one place for long. In answer to the second part of the question (and such a thing would probably be well down the line in the healing process) I don’t think it too hard to imagine Amish visiting with these families, if it were something both sides were agreed to and felt would be constructive. One of the shockwaves of these events is the pain and memories no doubt stirred in the families of past victims of similar violence. I can only think this shooting will be high on the minds of the Amish parents and families of Nickel Mines. It’s good to keep all such victims in mind at times like these. Thoughts and prayers should be first and foremost with the Sandy Hook children, school staff and their loved ones. The families in Connecticut just trying to absorb what happened are going to need a lot of help in the days to come. Probably more than any human power can give. Unbelievable! Seems like we see one nightmare after another on the news. My heart aches for those families and the community. It could happen anywhere at any time. My thoughts and prayers are with those folks. The holidays will never be the same for them. Yes, the tragedy at nickel mines came to my mind immediately. We are living in terrible times and it will only get worse as our culture moves further from its Christian past…I wonder how God will use the events of nickel mines to comfort some if these families. Definitely a need for prayer and you are right, this will bring fresh grief to the Amish families who suffered in 2006. All are in need of prayer. It brought back the memory of the Nickel Mines to me when I heard of the conn. shootings. I also wondered if the Amish would go to help comfort these families that are affected. So many from the english world reached out to the Amish when they had bad stuff happen to them. I think it would really help others, if the Amish could reach out in this time of sadness and share the grief. My heart goes to anyone that goes through something like this. I have Amish friends and think that they would be willing to counsel these folks as I think it would fall under “ministering” and I think I will call one of them tomorrow and ask, but I have no idea how that would be arranged. They would have to hire a van to bring them up. Not just for the Amish, but this is a time for true Christians to stand up and show Christ to others. And pray, more than ever, because as Erik said, they need more than “human power”. Having lost a 10 yr. old grandson a little more then a year ago, I wept for these parents, siblings, and yes, the grandparents! My question to the public would be this…How can we expect God to never let something like this happen if He isn’t even allowed in the schools anymore? In reply to your comment, I respectfully disagree. I do not believe God “lets” tragedies like this occur. However, I believe he comforts and carries us through the losses when they occur. Our God is not a vengeful God who allows innocent children to die, simply because he is not “allowed” in public schools. Indeed our God is mysterious, and we do not know why this occurred;however, what we do know is that it is part if God’s wonderful and mysterious plan. It is my personal opinion that he does not want things like this to occur, but he understands the evils of this world and is here to help and guide us through them. Anyways, that’s just my thought. So Claire, are you saying God DIDN’T let this happen? So why did it happen? Am I not understanding what you are trying to say? I whole heartedly agree with the rest of your post. But I’m not sure I understand what you mean by your first statement. Mary, that is a perfectly valid question. First, I would like to make it known that I too grieve with these families, what happened was devastating I can’t imagine what they’re feeling. Also, I don’t have all the answers, and am still searching in life. However, I am convicted that when you say “God” isn’t allowed in schools, that that isn’t true. God will make his presence known everywhere, and was indeed present during that tragedy. God gives us free choice, he allows us to make choices, and (I know it sounds cliche) but everything he allows to happen, happens for a reason. As previously mentioned, he has a plan, and he never promised it would be easy. God knows that these things will occur, but he promises that our Christian journey will be worth it. To address your question, it wasn’t that God let it happen or didn’t let it happen. Rather, it was the attack of the devil on those who were affected and others to lose one thing that is essential to humans- hope. No hope also means your faith takes a toll- whether it be your faith in humanity or God. The thing is, the devil is always trying to find a way to rid us of our faith/hope, and this is how he rids our hope and faith- in the case of the tragedy in Connecticut, taking advantage of the shooter, who was deemed mentally ill and harming our loved ones. It is essential to remain strong in our faith and pray for those in Connecticut. I do appreciate what you wrote in this post and agree whole heartily. I actually did not mean that God wasn’t there, as I know He is everywhere. My thought was more on challenging the ‘unbelievers’ that want to dismiss God from the schools, etc. to…What do you expect, ignore that God exists until something like this happens, and then turn around and blame Him! (Who they say doesn’t exist. )Thanks for your input! As a child, I can remember the little spark of anxiety I felt when my father wrapped up his prayers with, “Lord come quickly and take us home.” I liked our world and was a little fearful of leaving it for the unknown…no matter how wonderful Heaven sounded. As I have grown to know and love the Lord, I have tried to be mindful to lay up for myself treasures in Heaven. It’s important to remember that this world is not our home. I pray that if some similar tragedy struck our family, I would have the faith and trust to say (like Joseph did to his brothers) “you meant evil against me, but God meant it for good.” I don’t know that I could, well, I know I couldn’t by my own strength. I will continue to watch for the Lord to show his strength in our present weakness. David Letterman read a statistic on his show in the last couple days that said since 1994 there’d been 70 school shootings. Not sure of the whole criteria they used to determine this number. But that’s way too many in this old world. Thank you Carolyn. I don’t know if that 70 shootings stat seems high or low to me. I am interested in knowing if the rate of these occurrences is accelerating. I agree with you completely Alice Mary…while there might not be organized pray….our children can pray in their hearts and minds everywhere. The problem with our society is that parents are not teaching their young children to pray or that God is first, others second and themselves LAST. I see parents who are raising their kids Christian and then are upset they are expected to bring their kids to Mass on Sunday….yet they can chauffeur them to all their sporting events. Those should be leisure activities after we put God first. I am so, so saddened by this world. …and I feel the need to hold all 5 a little closer this Holiday season. May God Bless all our families and see them all to a safe New Year. May we pray without ceasing! Some are saying when the Mayans predicted the end of the world…that they were referring to the end of HUMANITY as we know it! By the sequence of saddening news..it seems that just very well might be the case! Members of the Amish community where a gunman killed five girls in a one-room schoolhouse in 2006 are writing letters in an effort to reach out in sympathy to grieving parents in Newtown, Conn.
A farm services business owner who isn’t Amish has promised to drive the letters to Connecticut. He said Tuesday that he raised the idea over the weekend with the father of woman who was teaching the day the massacre occurred at West Nickel Mines Amish School. The Intelligencer Journal/Lancaster New Era reported that the Amish were struggling to find the right words. A bus load of Amish people went to Newtown, Connecticut, on Saturday, May 31, for an event, titled “Community Connections: A Day of Shared Experience.” It offered an opportunity to forge connections through shared experiences of trauma. Isolation can be a risk factor after a trauma. People from Virginia Tech and Columbine, Colorado, were also there. “Disembarking from a large tour bus, over thirty members of the Nickel Mines Amish Community gracefully crossed the threshold into the Newtown Community. Still grieving from their own 2006 horrific school shooting, there were survivors, teachers, EMS workers and parents of victims. The pain has a ripple effect, reaching even farther over time. A good friend’s daughter (a young social worker) was sent to counsel survivors of the Chardon shooting just after it happened. It proved to be too much to bear, and not long afterward she experienced both a physical and emotional breakdown that forced a career change. I pray for anyone affected by these tragedies…no matter how far removed they seem to be.